Here's your chance to get aboard the newest arc of 'Vampirella' with a new creative team and an all-new adventure that finds Vampirella caught between a budding romance and those looking to kill her in a wasteland of her own making. This latest iteration of Vampirella is quite a departure from the classic vamp we're familiar with. Gone is the revealing red bikini and long silky hair. They've been replaced by an off-the-shoulder dress with leggings, a short do, and a leather jacket. It's a fitting look for a world a thousand years in the making where the living dead roam and someone is out to get Vampirella. With only her crush Vicki and a motorcycle, Vampirella is on the run in a Mad Max: Fury Road meets Army of Darkness adventure. 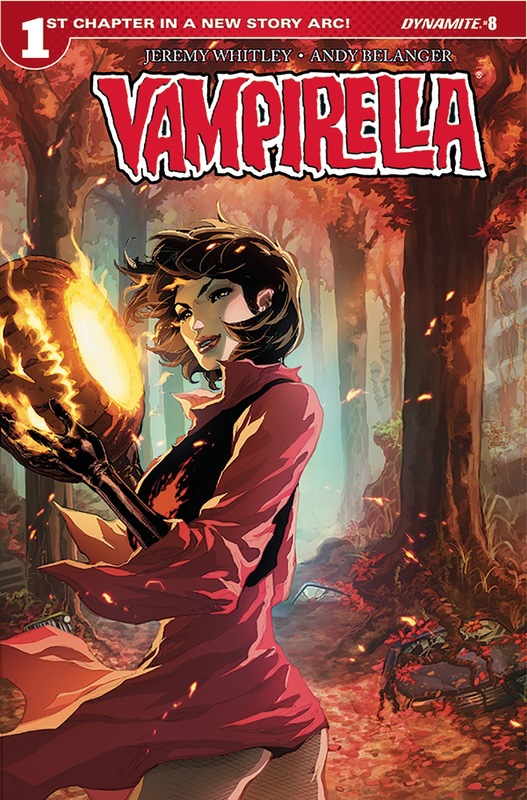 Usually, Vampirella or Ellie as Vicki affectionately calls her is the focal point of supernatural otherness, living amid mortals battling demons under the radar. Here, Whitley has turned the world upside down creating a type of dystopian landscape worthy of Georges, Miller and Romero. But what's most striking is the sheer amount inner monologue and dialogue. I've never seen Vampirella talk so much in a comic. Whitley instills a sort of cadence or rhythm to the banter that is surprisingly dense, like reading Vampirella's train of thought almost non-stop. Her exchanges with Vicki and also very extensive but often funny and poignant. It's sweet how Vampirella tries to fight her feelings for Vicki ending up in an awkward moment. Luckily, it all works and makes for a unique experience. It's like Whitley has summoned his inner Aaron Sorkin to the script. The action leads to gore and funny quips which will remind one of Army of Darkness and that's not a bad approach for a Vampirella comic after so many straightforward supernatural stories. Adding a crazy sense of humor and horror only reinvigorates the series. For all the intimate dialogue and exposition that opens the issue, the ending closes on a cliffhanging crescendo that blows the story wide open. Andy Belanger's dramatic redesign of Vampirella follows previous artists who've found more realistic and less sexualized attire for her. She's always been fierce and dogmatic in whatever she's wearing but the rebellious biker girl aesthetic really lends itself to a desolate hellscape that's dangerous and seemingly lawless. Overall, Belanger creates a fresh new look with clean lines, detailed panels, and fun gross-outs. Lee Loughridge limits his color palette appropriate for the dusty dirty setting, mainly desert tones with splashes of deeper gradients of red. 'Vampirella' #8 is a good entry for new readers who want to jump into a crazy cool dystopian horror dark comedy. Traditional Vampirella fans may be shocked and a little taken aback by this version of their favorite vampire but once they settle into the groove created by Whitley, there's a lot of fun to be had. Dynamite isn't afraid to reinvent their most popular characters from time to time and what Whitley and Belanger have done is propelled Vampirella in a wild new direction. You have to read it to believe it. Get it now!